Polypropylene (PP) is an attractive material for packaging based on the excellent price/property relationship and its versatility. The natural weathering (NW) behaviour of PP during five different periods in a year represented as NW1, NW2, NW3, NW4 and NW5 is investigated. The structural changes of weathered PP are followed using Fourier transform infrared spectroscopic technique. Various indices like hydroxyl, carbonyl, vinylidene, lactones, ester, carboxylic acid and crystallinity are calculated for the weathered PP samples. The variation in mechanical properties like tensile strength and elongation at break percentage are determined. 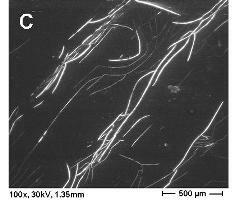 Weathered PP having increased carbonyl index showed surface cracks in the scanning electron microscopic images. Attempted life time prediction using mathematical models showed that the formation of carbonyl groups and the loss in tensile strength are dictated by the average temperature and the UV and the visible part of the solar radiation.